Interest rate predictions made in late 2018 are being largely reevaluated by economists, lenders, Realtors, and home buyers. At this point of the year it was assumed we’d be seeing numbers around 6% and this morning, long term rates fell around 4.19%. In essence, buying a home has been cheaper than everyone thought it was going to be. This is good news for home buyers. It is such good news, in fact, that March saw the highest number of buyer applications in a decade as rates were falling to levels, we haven’t seen in a while. As it is, buyers gaining about $20-25K in purchase power compared to October 2018 when 30-Year rates were about 0.612% higher. First-time homebuyers are jumping into the purchase application pool in order to take advantage of the rates before they spike, but the general consensus among economists is that they’re likely to stay at this level for 2019. Though it’s a popular time to get out there and buy- as inventory has been higher this year than last year for the first time in 6 years- buyers can likely be fairly confident that the rates and the housing market will be on their side for the year. This is all under the assumption that these predictions are actually going to come to fruition contrary to what was perceived at the end of 2018. 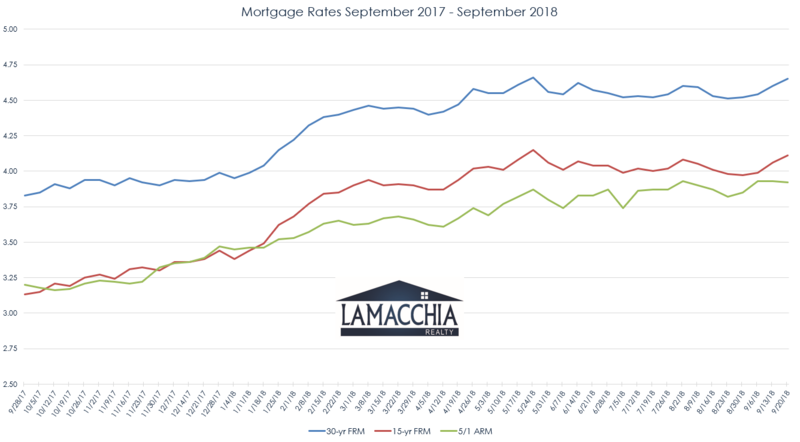 September 2018 saw the highest rates since 2011 and if the trend continued, all predictions would have been dead on and rates would have been quite high by now. There were clues to this interest rate cool down at the end of 2019, as Anthony’s predictions for the year mentioned how the Fed was backing down its messaging about interest rate hikes due to the bond market’s slower performance at the time. Based off that as well as from trade nervousness and political concerns, Anthony clearly stated that he predicted rates would come down with the resulting economic slowdown. Economic performance is directly correlated with how interest rates perform; a strong economy drives rates up and a slower economy brings them down. Right now, with the utter lack of inflation, rates are living in the mid to low fours. Contrarily, back in the summer, rates were in the high fours, almost 5% range and it slowed the market down because it was more expensive for buyers to borrow, which was one of the three reasons Anthony discussed in his op-ed about the market changing. The settling down of rates are not, however, a sign that our economy is weakening because it’s not necessarily the US economy that’s driving the train this time. The global economy being swayed by various factors including Brexit, trade relations with China, and fuel, among others, has been a major player in how the Fed has set rates. However once Brexit fears, trade fears with China and other geopolitical issues calm Anthony feels rates could increase again by later in the year. “For now I think its safe to say rates are steady but once we are past this trade dispute with China as long as there isn’t some other crisis I think we could see rates rise again by next year,” stated Anthony Lamacchia. It’s obvious that buyers are happy, but sellers should be happy too! This means that buyers can afford more house if it’s less expensive to borrow! Pricing aggressively to attract the right buyers will help drive up interest in the home and give buyers the purchasing power to make a strong offer.